Apple rolls out iOS 5 update to fix battery life | What Hi-Fi? 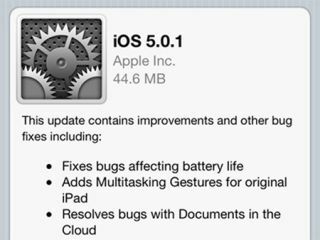 Apple has released its iOS 5.0.1 update in a bid to fix the battery-related faults encountered by iOS 5 users since its arrival. Early reports suggest the update has solved the problem of crippled battery life that's blighted some iPhone 4S users – caused by software bugs. Hopefully it'll mean an end to carting around portable chargers, making mad dashes to the Apple store for a battery boost, or having to charge up in the middle of the day. In addition to the battery-related fix, iOS 5.0.1 also brings with it a number of other key features and fixes. Original iPad users now get the same multitasking gestures found on the iPad 2, including four or five finger swipes to pull up the multitasking bar, pinch to return to the home screen, and swipe left or right to switch between applications. The update also irons out the bugs discovered in Documents in the Cloud and delivers improved voice recognition for our friends down under who can't get enough of the new Siri feature. However, there appears to be no word on the rumoured security patch for the Smart Cover vulnerability that saw anyone with a Smart Cover (or a magnet) gain access to any password-protected iPad 2. The update has all devices covered – so the iPhone 4S, iPhone 4, 3GS, iPad 2, iPad and the 3rd and 4th generation of the iPod Touch. As ever, you can update the software using your iTunes account – or more excitingly, for the very first time, you can update over the air via wi-fi, which we're pleased to report is as seamless and hassle free as expected.